Conveniently located in Bangkok's trendy Sukhumvit Area, 3 minutes walking distance to Asoke BTS Skytrain and Sukhumvit MRT subway stations, Grand Mercure Asoke by AccorHotels, is located in the city centre. It offers an easy and quick access around Bangkok on a calm street, with suites and apartment from 71 m². Discover Terminal 21, a famous shopping centre around the corner, then relax and enjoy the view at our rooftop swimming pool or dive into the great nightlife located around the area. GRAND MERCURE Asoke Residence is located in a central business and leisure district. Easy access through BTS and MRT (500m), Airport Rail Link at Makassan train station (800m) or simply enjoy our free parking. Perfect for a family or business stay. Located in the heart of Southeast Asia, Bangkok is a modern and lively city with a variety of attractions to offer. The bustling city is filled with magnificent palaces, diverse cuisine from world-class restaurants to street stalls and shopping malls. I really really love theroom with all facilities and huge size. Staffs were excellent, especially Lalita. I found the rooms very generous in size. I have not stayed in a apartment type hotel before were everything is provided like kitchen and laundry facilities. Everything was clean, modern and in good working order. The bed was very comfortable. Even though the Asok BTS is only a 5 minute walk away, the Hotel provides a free shuttle service to the station and back. Good and friendly staff. Near Healthland massage whereby you can go there at any time. Walk to Asoke station a bit long, but there is hotel transport. Good value for residence stay. We will be back, but not have the breakfast as the cost was not worth the food offered. The rooms are great, however there should be thicker duvets or at least 2, as it was very cold in the room, even with the AC on 25 or 26, if we turned it off, it got to hot, so either very cold or very hot. The pillows are also very hard, and my wife and I both had sore necks. Besides this, everyone was very helpful and we will be back to stay again. The staff excelled in every way to help & assist their guests. It's fair to say that all staff gave their maximum effort every day & backed up with a genuine smile. The room was excellent, unfortunately the breakfast ist not too much variants. Location is very quite, but only 5 min walk to Asoke BTS. room upgrade was great. room is clean and large enough. Two times stayed there, satisfied experience especially for the hotel staffs. Enjoyed 2 comfortable quiet nights in this clean well located Hotel. All was good, no room for complain. Very good located hotel offers spacious rooms (studios) with excellent equipment. Only this time (I have already stayed in this hotel several times) the hot water in the shower did not work. 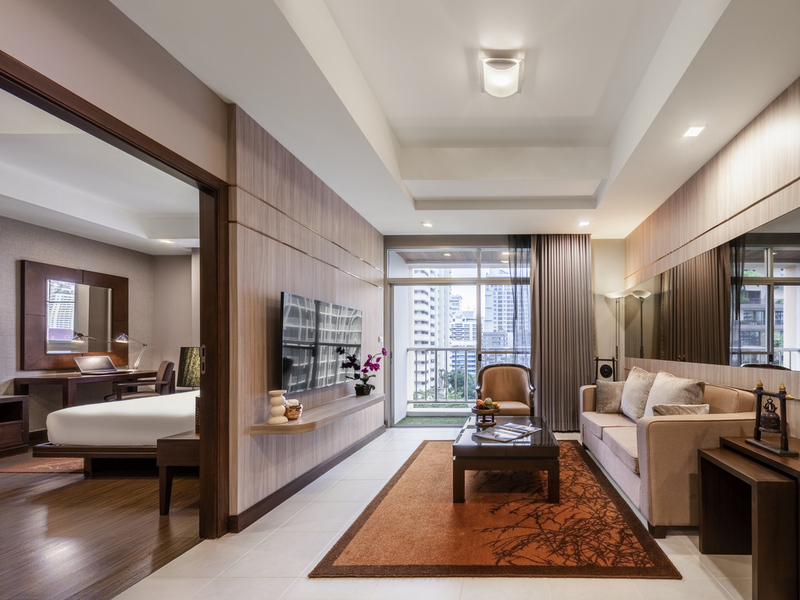 The Grand Mercure Asoke Residences is located in the quiet neighborhood in the vibrant Sukhumvit area. You can virtually go anywhere in the city because it only takes about 10 min to walk to the BTS Asok or MRT station. Near the hotel, there is TOP Market supermarket where you can buy real food to cook at the hotel or the fancy restaurants at the nearby Terminal 21 where you can taste every corner of the world. The hotel staff was kind and patient. And the assistant manager, Mr. Sam, was courteous and made our trip as enjoyable as possible. Moreover, the suite was spacious and it really looked like a home in a foreign land. Overall, one of the best experiences! The service is always excellent and the apartment both beautiful and functional. Improvement will be difficult as perfection is the final resting place. * Staying is good. * Need improving on breakfast menu.